Given the history between the two nations, the olive branch offered by Armenia to Turkey before their recent Euro 2016 qualifiers was an extraordinary gesture. What was at first seen as a diplomatic nightmare was, instead, seized upon as a diplomatic opportunity. In 2008, Turkey were drawn in a qualification group for the 2010 World Cup finals in South Africa that included Spain, Bosnia, Belgium and neighbouring Armenia. The game with Armenia presented several problems. Firstly, Ankara and Yerevan had not established diplomatic relations since Armenia declared independence from the Soviet Union in 1991. Secondly, and probably more importantly, the border between the two nations had been firmly shut for more than 15 years. The two countries were not on speaking terms thanks to one of the darkest moments of the 20th century: the thorny issue of whether the deaths of as many as 1.5million Armenians at the hands of the Ottoman Empire, from 1915 onwards, should be classed as a genocide. Turkey vehemently denies a planned destruction of a people; almost all genocide scholars and most Western nations – including Germany and Canada – believe it was. The game in Armenia looked at first as if it could be explosive, with Armenian nationalists planning to picket the game. Then something extraordinary happened. 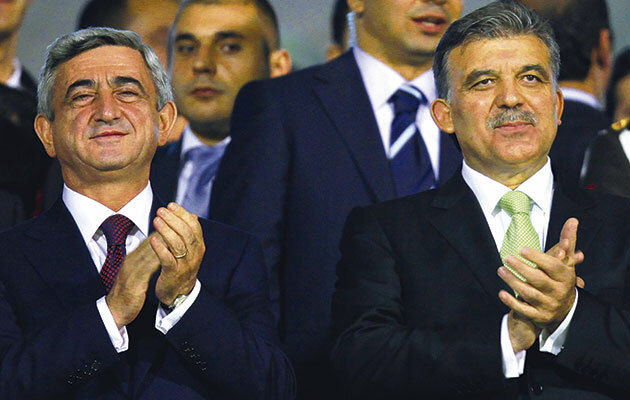 “I hereby invite President Gul [of Turkey] to visit Armenia to enjoy the match together with me in the stadium,” Armenia’s president Serzh Sargsyan wrote in a Wall Street Journal opinion piece a few months before the game. “Thus we will announce a new symbolic start in our relations. Gul accepted and made the first visit to Armenia by a Turkish head of state in modern times, while 5,000 Turkish supporters were given rare permission to travel to Yerevan. The build-up to the match was tense, almost relegating the football to second place. “This is only a football game, it is not a war,” said Turkey coach Fetih Terim. Protesters lined the route of Gul’s motorcade to the stadium, but the match passed peacefully, with Turkey winning 2-0. Shortly before the return match in Bursa – also won 2-0 by Turkey – foreign ministers from the two countries signed an agreement, laying out a road map towards full diplomatic relations. As popular as the club game is in world football, only international football possesses that level of influence, power and potency. While club football’s local identities are being diluted by globalisation, international football has maintained its core raison d’etre as one of the last unshakable symbols of identity and nationhood that a country or people can clearly recognise. It is perhaps because of this that football is at its most political when it comes to the international game. Rivalries tend to be rooted not just on pure geographical proximity, as most of the great derbies in the club game are, but in war and conflict. Armenia and Turkey would not have faced each other in any other arena other than a sporting one. George Orwell famously wrote that football was “war minus the shooting”. The phrase came from his 1945 essay The Sporting Spirit, about a Russian team playing a series of bad-tempered exhibition matches in the UK. It is full of observations on how sport in general, and football in particular, is an extension of the political realm, which feeds what he viewed as an evil nationalism. “If you wanted to add to the vast fund of ill-will existing in the world at this moment,” he wrote, “you could hardly do it better than by a series of football matches between Jews and Arabs, Germans and Czechs, Indians and British, Russians and Poles, and Italians and Jugoslavs [sic], each match to be watched by a mixed audience of 100,000 spectators.” Seventy years on, those matches are the most sought-after in the world game. The biggest events watched on TV are football matches between national teams. The most watched single world event is the World Cup. Half-empty stadiums fill to the brim when North play South Korea, Holland play Germany, Honduras play El Salvador (the first football match to spark a war, as it did in 1969), Serbia play Croatia and Scotland play England. Each rivalry is rooted in a list of historic grievances and bloodshed. Rivalry as proxy for war has long been a staple of the international calender. When Yugoslavia broke apart in the 1990s, each new nation quickly established its own national team. They were soon playing heated qualifying matches against each other – which were both violent and cathartic – but the hatred diminished with each passing match. When Serbia went to Zagreb to play Croatia in a World Cup qualifier, visiting fans were banned and that could be an indication of the future. Some games are now considered so politically explosive that FIFA and UEFA have intervened to make sure the countries can never play each other. Azerbaijan and Armenia are kept separate during World Cup and European Championship draws, for example. Both countries remain at war since the late 1980s over the status of Nagorno-Karabakh, a pro-Armenian, unrecognised republic that Azerbaijan says is still their territory – and the issue over which Turkey closed its border with Armenia in 1993. When Gibraltar was admitted into UEFA after a long legal battle, one proviso was that they would never be drawn in the same group as Spain, who still have claims over the peninsular. Most recently, UEFA and FIFA moved to ensure Russia and Ukraine – who are currently fighting a pro-Russian insurgency in the east of the country – can’t play each other either. After the Euro 2016 qualification match last year between Serbia and Albania, teams with a fractious history are likely to be kept further apart in future. Perhaps UEFA and FIFA have taken a leaf out of Orwell’s book. 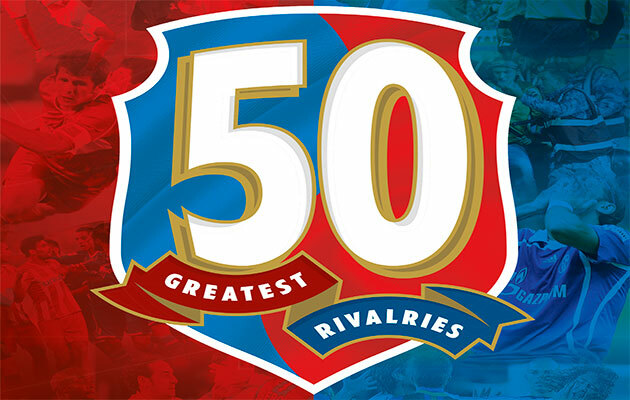 This article was first published in the December 2015 issue of World Soccer, as part of our celebration of the 50 greatest rivalries of world football.